Do you guys do your own past due collection or have some other company do it for you? So I'm curious, do you guys do your own past due collection process, or do you outsource it to someone else? Can you also share your reasons as well. I send "Crooked Nose" Tony and his boys for collections. Reason: It's a "family thing". We do our own collections, I try to call atleast 2x a week to collect. Of course, we have that group of tenants who are late every single month and there's nothing we can do about that except collect the late fees- which is OK with me because that means more money for our business. We rely on google texting for courtesy reminders for upcoming due dates-and found that the customers (especially the millennial and thirty somethings) really like the reminders. Our delinquency rate is very low because of it. Almost every single person we text says thanks for the reminder, thanks for saving me a late fee! I misunderstood. I thought you were talking about collections from tenants that moved out owing money or still owed after an auction. If that is the case we do not send people to collections for that because I haven't had anyone move out owing money or an auction going on 2 years. If you are talking about late fees, I don't call to remind them. They are 18 and an adult. They need to be an adult and pay on time or get late fees. If I have a great tenant that I see has not paid yet and close to late fee, I will call and/or text them about that. Hah, interesting. Can you please elaborate on the Google texting thing? We were trying to set up texting via our accounting software but they want too much money for it so the owner doesn't want to do it. We do call our late people like you do, but again the ad was offering to do it for us. That's why I was curious. I just signed up for Google Voice and was able to send and receive text messages to my own cell phone. I need to do some more playing around with it, but it looks like we'll be able to use it for texting. And the most awesome part -- it's totally free! 1. 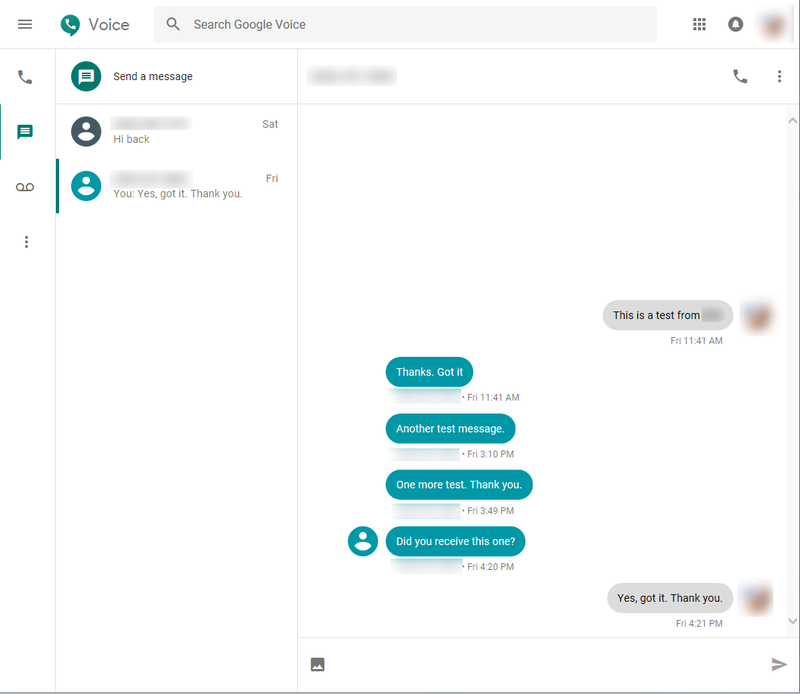 Is there a separate Windows app that we can use to view incoming and outgoing text messages with, kinda like Outlook Mail app but for Google Voice? Or do you have it open in a web browser. 2. I'm assuming that you can't use your main facility number to text from, is there? I ended up getting some random number when I signed up for Google Voice. #1 Yes,I think you have to have the web browser open to view it. You can always print out the conversation if needed for their file for reference. And #2, that's correct, that's why we identify ourselves at the beginning of the text because our tenants wont recognize the number. One thing it does that I wasnt aware of until recently- it actually calls land lines and leaves a sort of automated "voicemail" of the text typed. I had a few folks call me, confused by the call they got from Google on their landline. One thing it does that I wasnt aware of until recently- it actually calls land lines and leaves a sort of automated "voicemail" of the text typed. I had a few folks call me, confused by the call they got from Google on their landline. Oh, you mean if you send a text message to some phone number that cannot receive texts (like a land line) the Google Voice service will call it and read the text message for them, correct? This Google text thing sounds pretty fantastic! Could you please send me some info as well? TIA wc1974! I make "courtesy calls" to my delinquent tenants. storEDGE will also auto send an SMS to remind the tenants that their rent is due each and every month. Don't put off until tomorrow, what you can do today. lady5563 yeah, if the accounting software provides it, that would be an ideal solution. Unfortunately it usually comes with a hefty charge for something that should be next to free. (A separate SMS service called Twilio charges close to $0.0075 per SMS, which is close to being free. That is just for a comparison.) I don't know about storeEdge software and how much they charge for that service though. Then you will need to pick a phone number for texting and if you want, connect your business line to it. (This will forward all incoming calls to that new number to be routed to your business line.) The only tricky part (for me) was picking the phone number for texting as there were none available in the city we were in, so I had to pick from a nearby location. Then when it's all set up you can send and receive texts with it. You will send them from a web browser (link above) and when you receive a reply the Google Voice service will send you an email with the notification. 1. It's a free service, so there's no guarantee that Google will keep it in a long run. 3. I would also not be sending any confidential info in those text messages as, like I said above, it's a free service so there's no guarantee for anything. Last edited by bnr_manager; 14th November 2018, 07:41 PM. We use it here too. The manager prior to me had trained the tenants to respond to payment requests through text. It works wonderfully. Reply to Are you for real, lady? There's a sign that says, "NO DOGS'. Reply to The manager made me mad, and that's why I'm like this! All times are GMT-5. This page was generated at 03:49 AM.